I went along to see Dr Mason a few weeks ago, just to follow up after a hospital appointment. He is always so thorough going through each letter, ensuring the consultants wishes are followed, medication prescribed and any further referrals or tests carried our immediately. We had done everything we needed to and I was armed with my pieces of paper, prescriptions and just before he said his goodbyes, he explained he had something to tell me. It was very serious the manner and I wasn’t sure what I was about to hear. He broke the news he was leaving the surgery, it wasn’t common knowledge at that point, but he was advising his personal patients. We chatted about why he was going, after all being a partner in a large practice like Burnham Health Centre is a good thing and he admitted he was happy at the surgery it was purely the commuting that was killing him, so he had found work at the Surgery which appears on the Channel Five tv series. At this point I totally respected his descision, when it comes to quality of life, that is far more important than any job and to be fair being a GP is just a job. I thanked him for making such a huge difference to my life, he had taken me through my downturn, my diagnosis and my real lowest points, to now my fight back, all of that was down to his care and help, so had it not been for him I wouldn’t be as well as I think I am right now. My weight is stable, my pain is managed, my specialists are all as requested and despite flare ups there is nothing that can be done for my condition, he has made sure I have the names of which Drs I am to see, and who I am to avoid. With a tear in my eye I said goodbye unsure if we would see or speak to one another again. Normally when I’ve had a blogging break I catch up with the oldest posts and chronologically in date order write up what has been going on, but I’m so far behind I just thing this time I will update you with what is going on now and then as and when I can, infill you with stuff from recent weeks. So two weeks ago I met up with a new Pain Management Consultant, to be honest I was sick to death of traipsing into London, the east at that, for a ten minute appointment where I would be fobbed off with excuses of “until your shoulder is fixed there is nothing we can do”. So I saw a couple of local Consultants, my GP and asked for someone nearby. A couple of days after my birthday along I went to the hospital in Windsor and met with Mr Desai. Firstly this was one of the only clinics I’ve ever been to that Andrew had been unable to attend, his workload was horrible and secondly it was running completely on time, if not a little early. I hadn’t even finished my pain questionnaire and I was being moved to outside his room, the nurse was hovering to take it from me and as soon as I had finished I was in with him. 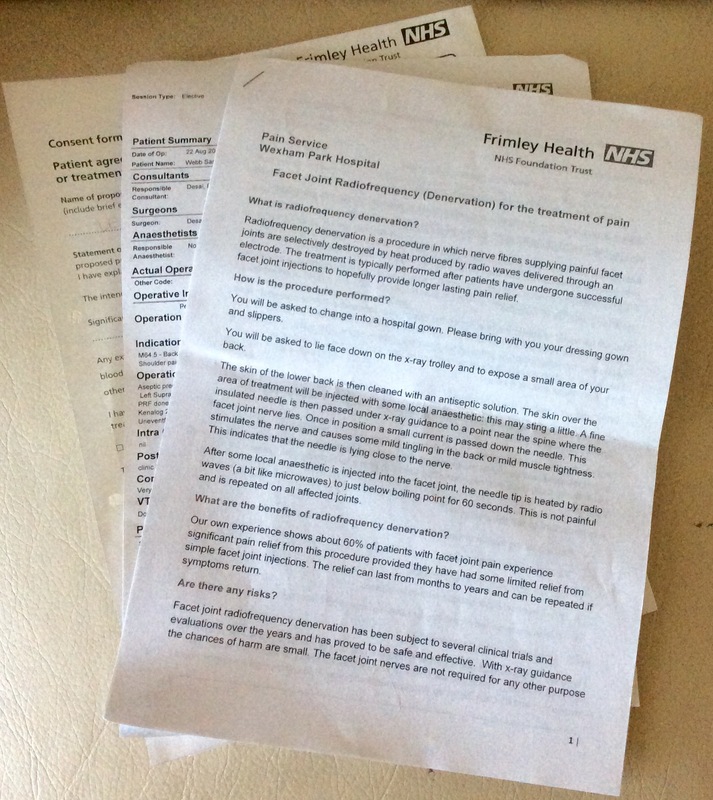 He was very warm and kind to me, I was put at ease instantly, he felt that I was the expert in the room for my condition and he would listen to me for pointers, we discussed my pain regime and he disagreed with everything I was on, he made recommendations and a letter would be sent to my GP to start the transition. Then he asked about my shoulder as this was obviously the standout issue and not specific to EDS, I explained how it had happened, what was being done, he felt he could give me further pain relief by offering me a Pulsed Radiofrequency (denervation) into my scapular, at the same time he would inject steroids and anaesthetic to settle it. I agreed as horrible as it sounded, I just needed relief from the pain. Consent form signed, and with the agreement of some CBT to maybe help with any psychological issues. I was soon on my way home, I felt the meeting had been successful, I hadn’t been back an hour when my phone rang and I was offered an appointment for ten days later, of course I accepted, a letter would be arriving with instructions. My letter dropped through the door and I was informed that I needed to attend the day surgery unit by lunchtime on Monday. Of course Sunday night I barely slept, I had flared up that weekend so was feeling really rough, typical EDS. We headed off to the hospital and Andrew chatted to me in the car trying to keep my mind off whatever was about to happen, we were both so preoccupied we took the wrong direction on the motorway, no idea where we thought we were going. So we ended up going the scenic route to Ascot, mind you we still got there early. A lovely nurse greeted us on arrival and took me to one side to complete my paperwork, I was astounded when she seemed to know about EDS and PoTs. She could see I was stressed and by blood pressure proved it, I have low BP, it was too high on this occasion so, as soon as she could she sent me back to sit with Andrew. I was fifth on the list so it was going to be a couple of hours wait, we sat chatting, playing on our phones and arranging flights for our daughter who is heading to Belfast to see her boyfriend ❤️ finally I had to get changed but was still allowed back with Andrew, she didn’t want to cause me any anxiety. Then came the call it was my turn, by now my knees wanted to give way but I just got my hug and kiss and off I went. I was taken to my cubicle and laid on a bed, the porter arrived and I was then wheeled to theatre. Now this was the bit that freaked me out, normally once you are taken into a theatre you are asleep but being in that environment awake is a bit too much. By now I could barely speak to confirm my name, it came out as a squeak. The big burly assisting Doctor David assured me I would be ok and the kind nurse sat and held my hand but I was terrified. They started by scanning for a good nerve, then placed a magnetic pad on my right shoulder, after lots of cleaning of the area, the local injections were put in, then the large needle was put in placed into my shoulder, yes it sodding hurt, pain, pressure, tears popped to my eyes and I stopped breathing and then I could hear someone say you need to keep breathing for the pain to stop. Then they started the frequencies into the arm, the first set were to shallow so Dr Desai asked for them to be switched up, I said you have to be kidding me !! So for six minutes (I know now) they left my arm twitching and dancing away, it was horrific, I found it so painful, I just wanted it to stop, I had no idea how long they were going on for at the time. The team were chatting and joking and asking me questions and I couldn’t speak, I just said I can’t this is killing me, I can’t focus. Dr Desai said ok we will leave you but they stayed close and the nurse never stopped holding my hand. In the end the machine stopped pulsing, thank goodness for that, before he removed the needle he popped in the steroids, they cleaned me up and sent me back to the ward. My lovely nurse came to check on me and I said despite it being horrific, I felt OK, I just wanted to go, could I have some water. She offered tea and toast but not being able to tolerate wheat or dairy makes me difficult lol, so we stuck to the water. She checked my obs and they were much better but still higher than normal, I asked her how come she knew about EDS, and I was so proud of her, she had discovered it via Instagram, being a nurse and having been to uni for all those years she was shocked she had never learnt about the condition, so she has done some reading, so she knows about rare patients like me. I was privileged to be under her care, if only there were more like her ! !